Senior government sources confirmed that China had also cracked the encrypted documents, which contain details of secret intelligence techniques, and information that could allow British and American Spies to be identified. The New York Times, The British Guardian and other News Organizations and supporters of Edward Snowden’s Treasonous act, they too have blood on their hands. 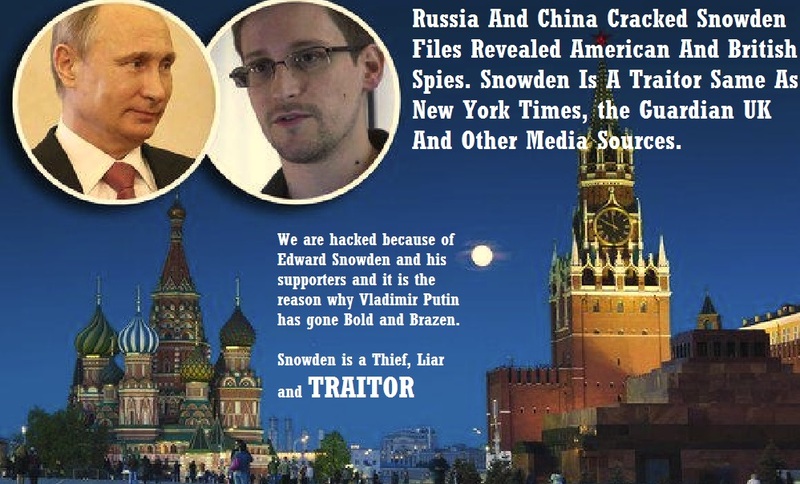 This entry was posted on June 13, 2015 at 10:34 pm and is filed under Uncategorized with tags American And British Spies Endangered, Blood On Their Hands, Britain, CHINA, Cracked Snowden Files, Edward Snowden, russia, Shame British Guardian, Shame New York Times, Shame Snowden Supporters, The Sunday Times London, Treason, UNITED STATES OF AMERICA. You can follow any responses to this entry through the RSS 2.0 feed. Both comments and pings are currently closed.